Since publishing Book 1 of The Cursed Ground, I’ve started to get questions from readers about the world the story is set in. I like to let the story tell itself, so I avoid including a lot of backstory in the narrative. But for those who are interested, I thought I would set out some of the very broad concepts behind the fictional world I’m using. Just to note, I’m releasing The Cursed Ground as a series of five shorter books. 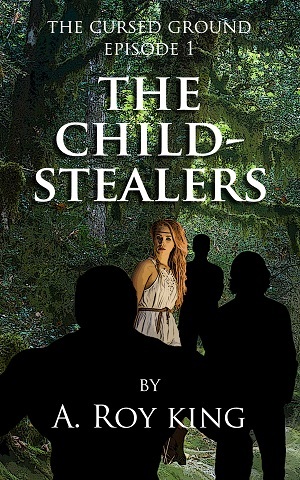 Book 1, The Child-Stealers, is already on the market, and Book 2, Children of the Keeper, is slated for release on May 5, 2015. In terms of genre, I conceive of The Cursed Ground as historical fiction. 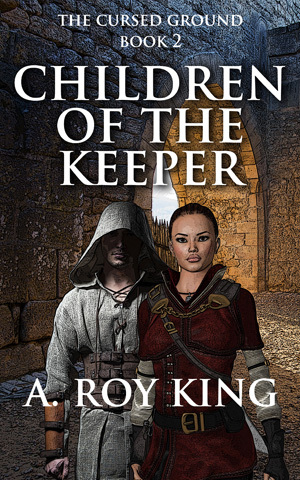 However, the book might fit better in the market category of historical fantasy. I don’t use magic or the uncanny (much) in the story, but I admit to speculative elements, simply because the historical period I’m dealing with is understood only in general terms. Humans commonly live for hundreds of years. Cultural memory is very stable, because the long human life-span allows considerable overlap among generations. All humans speak the same language (well, almost all — you’ll have to keep reading to get to that). The names of people and places all have an understandable meaning, because of the common language and durable cultural memory. For that reason, all names in the story have a meaning in English, since that’s the language I’m writing in. The human population is expanding rapidly into many millions. Human civilization and technology have reached a level of development much higher than the modern world might expect. The world is becoming increasingly violent and unstable. The world is facing a major extinction event, but no human knows it. The story is broadly based on the account given in the Biblical book of Genesis. Genesis is taken as an accurate historical and cosmological account, but not necessarily in the way that is often presented by religions of the world. The story assumes a very old Earth, but a relatively young human race. 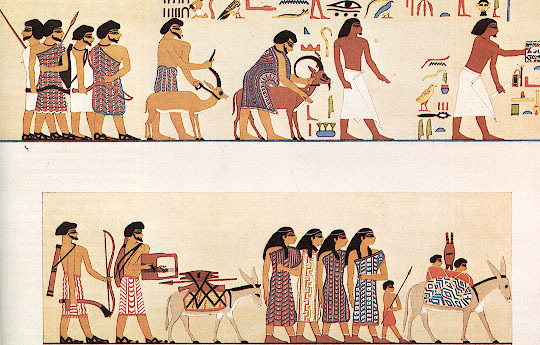 The conventional academic historical chronology is assumed to be accurate only back to about the mid-second millennium before the common era (BCE). The methods used to date all kinds of objects that researchers dig up from the ground are probably only accurate back to about 4,000 years before the present (BP). The older an object is, the greater the likelihood that the ascribed date is off, perhaps by orders of magnitude. During the early history of humankind, rainfall did occur on the Earth. This is a detail that matters, as many Bible readers take the view that it had never rained before the global flood. In the world of The Cursed Ground, Genesis 2:5,6 refers to a much earlier phase before the appearance of humans. 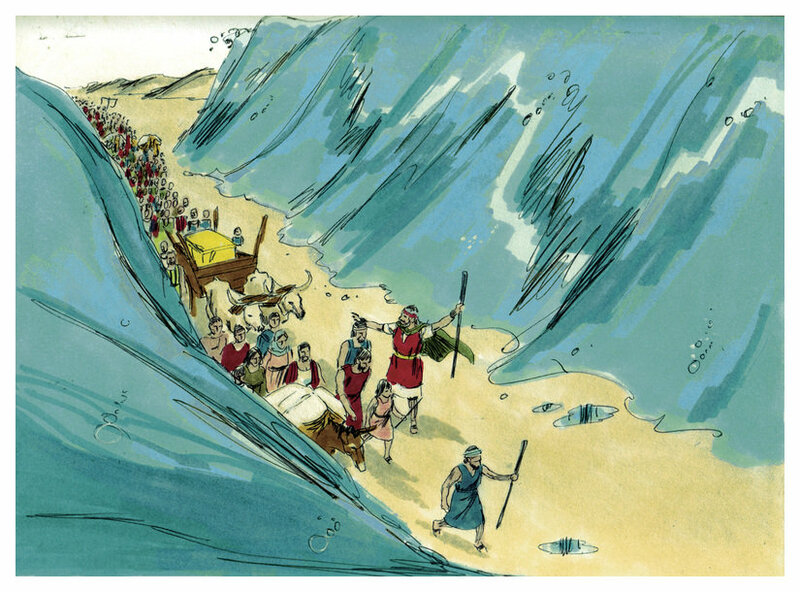 Writer of Genesis: Moses or Someone Else? What Would We Be Like if We Lived for Hundreds of Years? How Much Do We Really Know About Human History? I recognize that many of the assumptions I’ve mentioned here could spark controversy. I don’t mind discussing my rationales, but in the end I’m writing a story, so I don’t intend to get into ideological arguments with people who disagree with the way I’ve built the world of The Cursed Ground. It’s fiction, after all. 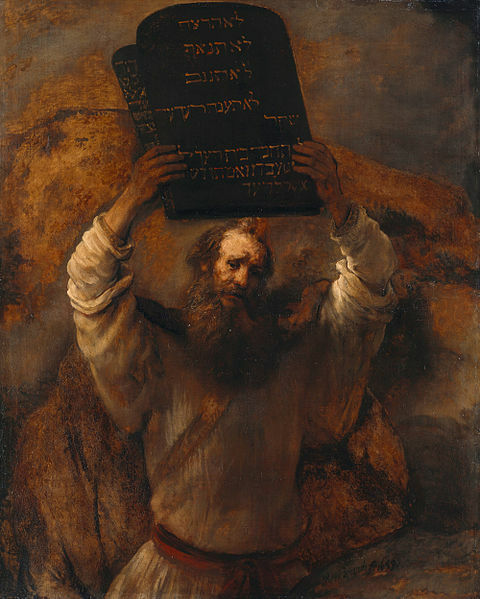 Rembrandt: Moses With the Ten Commandments. Via Wikimedia Commons. The question of who wrote Genesis has long been disputed among the erudites of religion and academia. I have a particular interest in the issue as a fiction writer, because the first installments of my Edhai fiction series are all set during the time period covered by the Bible book of Genesis, particularly the very earliest history recounted in Gen 1-11, from the creation of the first humans up to the time of Abraham. J, the Jahwist source — Prefers the personal name of God (YHWH, JHVH; Yahweh or Jehovah), particularly before Exodus chapter 3. 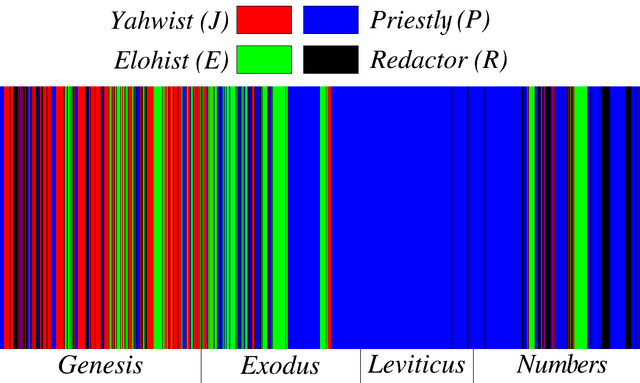 E, the Elohist source — Prefers the generic title “Elohim,” particularly before Exodus 3. P, the Priestly source — Concerned with ritual and formalism and prefers the title Elohim in referring to God. At Wikiversity, you can see a helpful text of the King James Bible, with the purported sources highlighted in different colors. Reviewing that overlay, I can see that the portion of Genesis I’m writing about, chapters 1 through 11, is attributed primarily to the Priestly and Jahwist sources, with ‘additions by a redactor’ inserted in some portions, supposedly to provide transitional language that ties the various original documents together to make a whole. For a basic overview of the documentary hypothesis, see the lesson on “Source Criticism” maintained by theology professor Ronald A. Simkins, but written, I think, by Ralph W. Klein. Fundamentally, the documentary hypothesis is based on analysis of the content of the Bible, rather than on a rigorous historical investigation. If different portions of the text exhibit different styles or different interests, those portions are attributed to different sources. If the investigators believe they have uncovered contradictions or anachronisms, those problems are attributed to the diversity of author sources. Chart of sources according to the Documentary Hypothesis. Vadym Zhuravlov, via Wikimedia Commons. 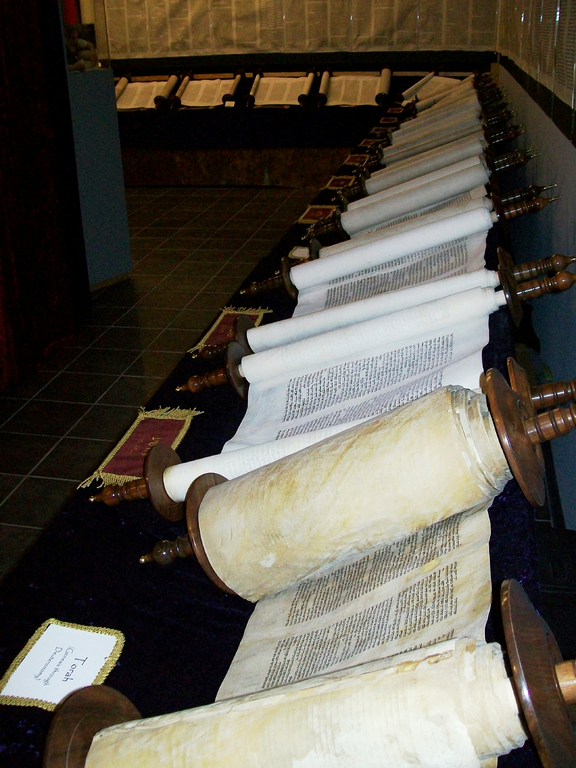 However, many of the adherents of the documentary hypothesis take things much further than the mere assertion that the Pentateuch is based on multiple documents. They employ complicated explanations to attribute those sources to particular time periods and to various religious and political elements within the nation of Israel, often with conflicting aims and agendas. In the conventional view, none of the four DH sources dates back before about 950 B.C.E., which would rule out any association with the historical Moses, about 500 years before then. In fact, many scholars claim that Moses never existed, or at least that he wasn’t anything like the personage portrayed in the Bible. Such extreme views are in turn used to convince students and the public that the Bible is fictional, and to prop up the materialist-atheistic bias that controls much of academia today. [O]thers have not been persuaded by these [Documentary] arguments and would still trace the basic unity of the Pentateuch back to Moses without denying that the text was modernized in the course of its transmission according to the common Near Eastern scribal practices. The point here is that I find no good reason to discount the existence of Moses or his writership of the Pentateuch. The Genesis account, including the first eleven chapters, are a legitimate source on which to base a storytelling project, which can reasonably considered historical fiction.